Reposted from July 4, 2014 (75th anniversary) - still a high interest read. As Cal Ripken Jr. circled the field at Camden Yards to accept congratulations for topping Lou Gehrig's consecutive games streak in 1995, he couldn't help thinking about the ill-fated star. 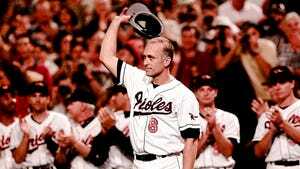 "His record was thought to be unbreakable," says Ripken, whose streak eventually reached 2,632 games. "Lou was in my thoughts, my speech and my talk with the media afterwards." Gehrig played 2,130 games in a row until he was physically unable to play anymore. A dying man at age 36, Gehrig stepped to a Yankee Stadium microphone July 4, 1939, and told fans he was "the luckiest man on the face of the earth." Seventy five years later, he is not only a Hall of Famer and New York Yankees legend, but his image and reputation also have grown almost larger than life. "He was a player for the ages," says former Yankees publicist Marty Appel, author of Pinstripe Empire: The New York Yankees from Before the Babe to After the Boss. "He didn't need the support of Babe Ruth to be a great player. His performance on the field spoke for itself. His speech was a baseball moment that had nothing to do with playing. It was baseball's Gettysburg Address." It can be argued, though, that Gehrig's legendary status began with his famous words. "When Gehrig gave his speech, it was the first time many of the people in the ballpark heard him speak," Appel says. "Radio interviews were not that frequent, so people in the ballpark did not realize he had such a strong New York accent." Gehrig, the son of poor German immigrants, had many qualities that belie his now-worldwide celebrity. He was quiet, dignified, soft-spoken and modest to a fault. He compiled gargantuan statistics without a gargantuan personality. Ruth cast a giant shadow on and off the field. Other than both men batting left-handed and wearing Yankees pinstripes, Ruth and Gehrig were polar opposites, with Ruth craving the spotlight and Gehrig preferring privacy. Overshadowed by bombastic Ruth early in his career and polished Joe DiMaggio at the end, Gehrig was always the tortoise against somebody else's hare. "If I stood on my head at the plate, nobody would pay any attention," Gehrig once said. "I'm just the guy who's in there every day, the fellow who follows Babe in the batting order. "Whether he strikes out or hits a home run, the fans are still talking about him when I come up." Even when he hit a home run, Gehrig was almost methodical in his gait, keeping his head down as he ran the bases. Doing this cost him a home run crown in 1931, when he passed Lyn Lary on the bases after hitting an apparent game-winning homer. Lary, seeing the ball clear the fence, went from third base to the Yankees dugout but Gehrig, deep into his trot, was ruled out when he passed the spot Lary left. Given a triple instead of a home run, Gehrig finished the year with 46, sharing league leadership with Ruth. A year later on June 3, when he became the first American League player to hit four home runs in a game, the news was overshadowed by the sudden retirement of longtime New York Giants manager John McGraw. That fall, Gehrig hit .529 with three home runs and eight RBI in a four-game World Series sweep of the Chicago Cubs. But fans and writers seemed obsessed with Ruth's "called shot" in Game3. Never mind that Gehrig followed it with a home run that provided what proved to be the game-winning run. "If Gehrig had stayed healthy, we'd be debating whether he or Ted Williams was the greatest hitter of all time," says Jonathan Eig, author of Luckiest Man: The Life and Death of Lou Gehrig. "I think Gehrig is underrated. If he had played another four or five years — which was entirely possible considering the shape he kept himself in — he would have finished with the best numbers of anyone in the game." Gehrig, a first baseman, did some things Ruth couldn't match: a four-homer game, a Triple Crown and stand-alone records of 500 RBI over a three-year span and 23 career grand slams. An RBI machine, Gehrig knocked in 185 runs, an AL record, in 1931 and topped 150 in six other seasons. "He was so proud of that," Eig says. "He always said he didn't care about home runs but that RBI were his baby." Gehrig always maintained he wasn't a headline guy. His feats suggested otherwise. The New York native was handsome and muscular. He hit a ball out of Wrigley Field as a visiting high school All-Star, struck out 17 hitters as a pitcher at Columbia University and was 20 when he joined the Yankees in 1923, the same year old Yankee Stadium opened. Yet he used his $1,500 bonus money to move his parents from the city to the suburbs and never earned more than $39,000 in a season even at the height of his career. Today, he might own the team. He not only played every day but produced, hitting .340 during the regular season and .361 in seven World Series. A model of consistency, he had five 40-homer seasons without ever topping 49 and collected at least 109 RBI in every year from 1926 through 1938. "I much preferred Gehrig to Babe Ruth," says Ray Robinson, author of Iron Horse: Lou Gehrig in His Time. "I liked my heroes shy and not full of themselves. I liked Lou's courteous, dignified and soft-spoken manner. So when they had Lou Gehrig Appreciation Day, I decided to go." When the Yankees held Lou Gehrig Day, the honoree had to be coaxed to the microphone by manager Joe McCarthy. "We're all trained to play the game, and we're comfortable at being asked to do things during the game," Ripken says. "But standing in front of a full house and talking not only to them but to the whole country took a lot of courage." In addition to the Yankees and Washington Senators, who were playing a doubleheader that day, witnesses included 61,808 fans, Mayor Fiorello LaGuardia, Postmaster General James Farley and former teammates from the 1927 Yankees team whose loaded lineup led to the nickname Murderers' Row. Ruth, whose relationship with Gehrig cooled after a cordial start, showed up to give Gehrig an unexpected hug. Although he hardly had the strength to reciprocate, Gehrig probably appreciated the gesture more than the plethora of gifts he received. Among them were a fishing rod and tackle from his teammates, a DON'T QUIT placard from the Senators, candlesticks from the Giants, presents from the management and employees of Yankee Stadium concessionaire Harry M. Stevens and a trophy from the Yankees featuring an eagle on top of a baseball. 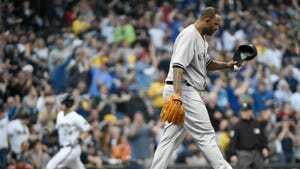 Teary fans watched the withered slugger recite his short message. 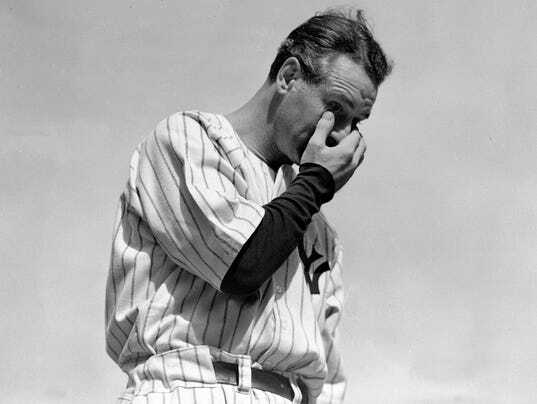 Ravaged by the rapid progress of a neuromuscular disorder called amyotrophic lateral sclerosis, Gehrig had removed himself from a game six weeks earlier, on April 30, and ended his streak by sitting out two days later. "I sat in the bleachers, miles away from where all the action was," says Robinson, 94. "But I could hardly see anything because of all the cigarette smoke that coagulated in the middle of the field during the first game. I could hear the speech, though, and reacted like most of the other 60,000 people: I had a hard time choking back my tears. Most of them realized his baseball career was over but didn't realize he was incurably ill."
Neither broken fingers, nor lumbago, nor myriad lesser ailments could stop Gehrig during his career. But ALS proved too formidable, even though Gehrig fans got a glimmer of hope when he hit two home runs in a spring exhibition game. Had he not battled the onset of ALS symptoms in 1938, his final full season, Gehrig might have matched Ruth's .342 career average. "It's a miracle he played at all in 1938," Eig says. "I think it's the greatest achievement in the history of baseball. He had symptoms of ALS throughout the season but still hit .295 with 29 home runs and 114 runs batted in, even though his muscles were melting away game by game. Before Gehrig was diagnosed with ALS, Robinson says he tolerated illnesses and injuries that included a deliberate beaning by former Columbia pitcher Ray White in an exhibition game between the Yankees and the Newark Bears, their top farm club. "Ray told me he didn't like Lou because when Lou came over to the Columbia gym to work out, he paid very little attention to him," Robinson says. Though woozy from the incident, Gehrig rebounded with three triples the next day but lost credit for them when weather wiped out the game before the requisite five innings were complete. "I often wondered what was the underlying motivation for Lou," Ripken says. "I assume it was the same as mine: He was a gamer and had a responsibility to play. I often thought about how cool it would be to have a conversation with him." Gehrig, who always placed the public interest above his own, accepted an offer from LaGuardia to serve on the New York City Parole Commission after he retired. The post paid little more than his 1939 World Series share. Gehrig theorized that wayward teens who idolized him might be motivated to straighten themselves out. He was right, at least about one; juvenile delinquent Rocco Barbella later became middleweight boxing champion Rocky Graziano. The former Yankees captain couldn't complete his 10-year contract with the city. He was 37 when he died June 2, 1941, almost exactly 16 years after he started his consecutive games streak (June 1, 1925). "I was always aware of how brave a player he was and how he went out there every day," Yankees manager Joe Girardi says. "I investigated his story even more after I became a Yankee. I even learned he worked in a prison when he stopped playing. When someone realizes he might not have a lot of time to live, he might take advantage of the situation, but Gehrig gave back to society, which I think is absolutely incredible." Today, Gehrig's stature has grown so large that even baseball neophytes know who he was. The qualities that made Gehrig fade into the background make him a hero. "He's not only right up there as one of the best players but he was a good person," says David Hale, a rookie pitcher with the Atlanta Braves who played in the Ivy League's Lou Gehrig Division at Princeton. "His speech was one of the most iconic moments in baseball history. It speaks a lot to his character and the respect he got as a player. He was faced with such tough knowledge but realized his blessings and focused on that." The Toronto Blue Jays' R.A. Dickey, who won a Cy Young Award while pitching for the New York Mets, says the speech resonated with him at a young age. "It was the most classy speech I have ever heard in a public venue," says Dickey, 39. "It was full of humility and grace. I especially liked the way he talked about other people, even thanking his mother-in-law for taking his side in disagreements with his wife. That speech was pretty special. "As I was growing up in baseball and became interested in the players of his era, he was at the top of the list for me." Dickey thinks Derek Jeter, who has played more games with the Yankees than any other player, shares some personality traits with Gehrig. "What Derek's been able to do in a culture where everyone has a cellphone camera, especially the way he's stayed out of trouble, parallels the way I perceived Lou Gehrig to be during his tenure as a Yankee," Dickey says. Like Jeter, Ripken spent his entire career with one team (the Baltimore Orioles), a rarity in today's game that evokes Gehrig. "I'm very proud of that," Ripken says. "I had some choices along the way and could have left, but if you're able to attach yourself to the team or if the team attaches itself to you, there's a great value in that identity. How funny would Derek Jeter look in a different uniform?" Gehrig was the first Major League Baseball player whose uniform number (4) was retired. He occupies a prominent place in Monument Park at Yankee Stadium, where Gehrig pictures, videos and quotations seem ubiquitous, especially in the team's museum. Gehrig also remains the most prominent American afflicted with ALS, the disorder often referred to as Lou Gehrig's disease. "We as a society owe a lot to Lou Gehrig for what he went through and the courage he had when he was going through it," says Ron Gant, a former Braves player and now a television personality in Atlanta. "For him to say he was luckiest man on the face of the earth meant that he was grateful for what the game of baseball gave him. There's still research going on because of Lou Gehrig. He had an illness that could affect anyone in this country." Phi Delta Theta, Gehrig's college fraternity, keeps his memory alive through the Lou Gehrig Memorial Award, created in 1955 and given annually to the major league player who best exemplifies the character of the Yankees legend. Curt Schilling won the award in 1995, the same year he named his son Gehrig. The pitcher-turned-broadcaster has raised millions for ALS research through Curt's Pitch for ALS, established in 1993. "Many people who were part of our lives either had Lou Gehrig's disease or knew other people who had it," Schilling said in 2001. "We said that someday hopefully when people say 'Gehrig,' they'll think of the greatest baseball player who ever lived and the disease will be gone." For now, Gehrig is the eternal Iron Horse, a symbol of someone possessing the utmost class and determination. "Tonight I stand here, overwhelmed, as my name is linked with the great and courageous Lou Gehrig," Ripken told the crowd in 1995 after he broke Gehrig's record. "I'm truly humbled to have our names spoken in the same breath."